Today is a great day to learn about Spotify's repeat function. There's a new movie coming out this year starring Lady Gaga and Bradley Cooper, maybe you've heard of it? It's called A Star Is Born, and it's a remake of a movie that's been remade approximately a million times (actually, three) which means there must be something special about it, right? This year’s version, in which Gaga has her very first starring role, was looked upon with no small bit of skepticism in come circles, but after the film's Venice Film Festival premiere and subsequent TIFF screenings, word on the street is that it's not only good, it's great. The movie contains a number of original songs written for Gaga and Cooper, including one that takes up quite a bit of the first trailer and has already inspired a family of memes all on its own. This song is "Shallow," and it includes one bit of vocalization from Gaga that's best written phonetically as: "HAAAaaaaaaa-AAAAAAA-aaaaaaaaa-aaaaa-aaaaaahhhh AAAAAAHHHHH aaaaahhhhhhh haaaaaaaaaa-AAAAAAAA-aaaaaaaaaaa-AAAA-AAAAAAAAAAHHH." Until now, we could only hear part of the song if we rewatched the (incredibly good) trailer -- but today, Lady Gaga herself posted "Shallow" in full to her YouTube account, a day before she'd originally promised. Mother Monster is so good to us. 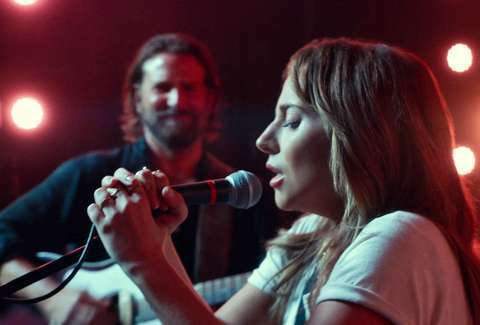 The video contains a lot of the "Shallow" scene straight from the movie: Encouraged by her new rockstar friend Jackson Maine (Cooper) to sing one of her original songs onstage, Ally (Gaga) takes the mic and performs a duet with Maine that is, without hyperbole, one of the most transcendent and beautiful movie moments of the year. Listen to the crowd cheering when she walks out! Listen to them scream when she goes REAL HIGH! Look at Bradley Cooper’s happy face the whole time!! A Star Is Born also features a bunch of other songs written by Gaga and Cooper in collaboration with a ton of artists, including Mark Ronson, Lukas Nelson, and DJ White Shadow -- but, let’s be real, "Shallow" is what the people are here for. Today, we’re all off the deep end. Emma Stefansky is an Entertainment staff writer at Thrillist. Follow her on Twitter @stefabsky.